Castanea sativa Mill. is an important species of the Balkan Peninsula with high ecological and economic value. 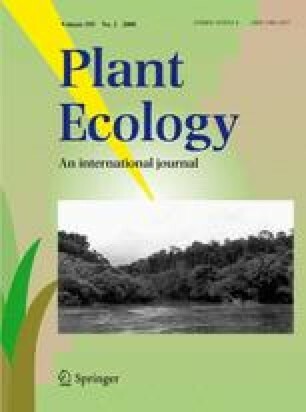 This article contributes to a phytosociological synsystematic approach of the C. sativa plant communities in Greece that covers the southern part of the Balkan Peninsula and describes the ecological parameters involved in their distribution and taxonomy. Phytosociological data have been collected from 14 mountainous areas across continental Greece, which are considered representative of the main forest types of C. sativa in the area. The 14 mountains demonstrate a variety of environmental conditions. Five communities (associations) and seven sub-communities (sub-associations) have been identified and described using TWINSPAN, Corespondence Analysis and the Braun-Blanquet classification scheme. Castanea sativa (chestnut) forests of Greece can be distinguished as three broad groups, defined primarily by their geographical distribution. In northern and central Greece chestnut stands are characterized by their high floristic homogeneity, which is reflected in the identification of only one community per region. Chestnut forests in northern Greece, in particular, exhibit strong floristic similarities with those of the rest of the Balkans. In southern Greece, on the other hand, the southern distribution limit of chestnut in the Balkans, there is a greater floristic diversity between the sampled mountains which is reflected in the presence of three confirmed communities and two sub-associations. Several factors have been identified as important in determining the structure and floristic composition of chestnut forests in Greece. Whilst climate and the grazing regime are influential, the degree of silvicultural management appears to be the most important factor determining the floristic composition of chestnut forests and their long-term sustainability. This research has been carried out the frame of the project “GeoRange” funded by the European Union (DGXII, EESD, EVK2-CT2000-00091), the project “ATHOS” funded by the National Agricultural Research Foundation (N.AG.RE.F.) of Greece, the project “Survey of apiarian flora of Peloponnesus” funded by Hellenic Ministry of Rural Development and Food and the project “NATURA 2000” funded by the Hellenic Ministry of Environment, Physical Planning and Public Works.